This is a very sensitive subject for me because people close to me have taken trips to the loony bin and I do not want to offend them in any way. Mental health is a serious issue and it needs to be treated accordingly. When it comes to this topic, people can be very callous. It is important to note that mental health does not just refer to somebody going coo-coo. Mental health can also be depression and we will all experience it at different levels. I read an article on Her Zimbabwe about a woman who lost her mind just after child-birth. I cannot stop thinking about it. Mental illness can happen to anyone, anywhere and it’s not anyone’s fault. 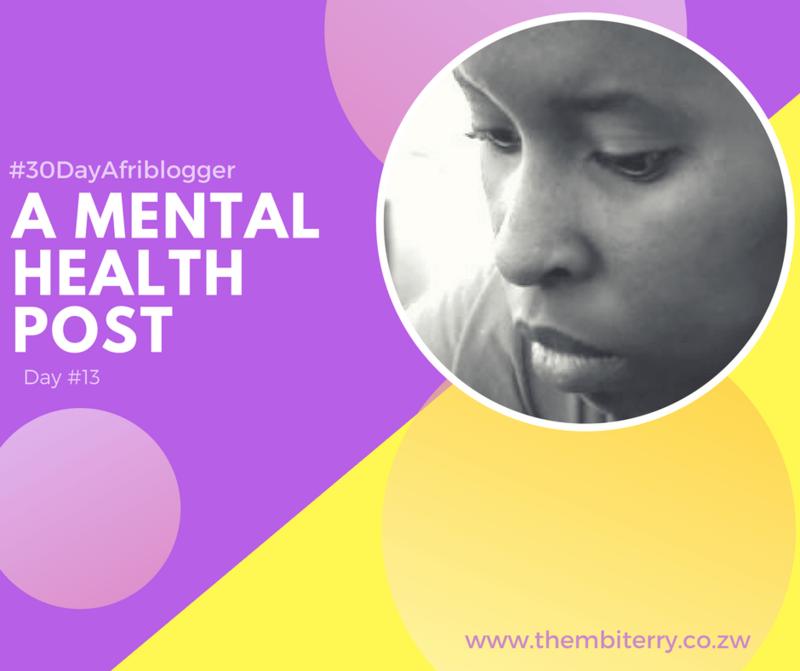 The trick is to detect I early on and start taking the necessary measures towards good mental health. When I was in high school I used to self-mutilate. I would cut stripes along my arms and thighs whenever I got depressed or stressed. That was my way of coping with the pain. As if physical pain coud distract me from the internal pain I was going through. I probably should have sought counseling then and I never. The self-destructive tendencies have intensified and I was probably better off cutting up my body. Somebody close to me had a bout of depression and tried to take her own life. The people around her taunted her for trying to kill herself. They asked her why she had failed. They called her a failure for bungling up everything including her suicide attempt. It was painful to watch because she was going through something very emotionally exhilarating. What shocked me is when the most beautiful girl I have ever known took her own life. She was my low-key envy. The girl had EVERYTHING and she seemed so well put together but she did this anyway. My heart broke. We need to look after each other. Show up for the people who you love. Give them attention, listen to them, let them know that you are available to them should they need a shoulder to lean on. I have 1700+ contacts in my phonebook but I cannot come up with a list of 5 people who I can get really deep with and that is disturbing.